Welty’s “A Worn Path” an exemplar of empathy & implication. 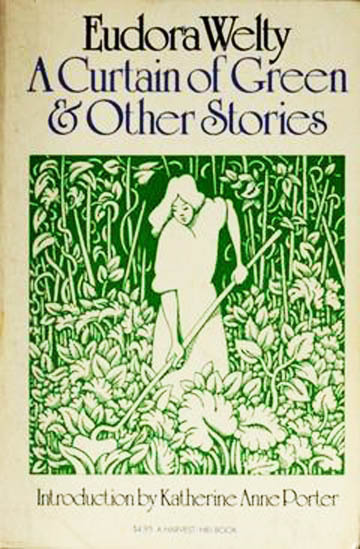 Eudora Welty’s short story “A Worn Path” depicts an aged African American woman, Phoenix Jackson, making an arduous journey through woods and fields along the Natchez Trace, an ancient trail, to the small city of Natchez, Mississippi. She’s challenged by the terrain and menaced by a stray dog and by a white quail hunter. Reading “The Worn Path” again, for the first time since I was an undergraduate, summoned its effect on me at twenty. Then, I marveled at why she went to town, revealed near the end, as if her motive was a trick Welty planted. This time, I marveled at how Welty got her there. “I wasn’t as old as I thought,” she said. . . .
She kicked her foot over the furrow, and with mouth drawn down, shook her head once or twice in a little strutting way. . . . .
Then she went on, parting her way from side to side with the cane, through the whispering [corn]field. At last she came to the end, to a wagon track where the silver grass blew between the red ruts. The quail were walking around like pullets, seeming all dainty and unseen. . . . Deep, deep the road went down between the high green-colored banks. Overhead the live-oaks met, and it was as dark as a cave. . . .
Over she went in the ditch, like a little puff of milkweed. . . . He patted the stuffed bag he carried, and there hung down a little closed claw. It was one of the bob-whites, with its beak hooked bitterly to show it was dead. . . .
There’s the magic of her “little strutting way,” though it may help if you love poultry. I imprinted on chickens about the time I walked. So I can testify to the perfection of quail “walking around like pullets,” but what’s thrilling is how such comparisons arise from Phoenix’s old-time country consciousness. Pick any metaphor above that you can test. As a new grandpa, I rejoice in “stretching her fingers like a baby trying to climb the steps” too. Welty looked, and she saw. But maybe you don’t have to know babies or setting hens, because if an image is perfect, imagination engages. Greater than scene, I came to see, is situation. Greater than situation is implication. Greater than all of these is a single, entire human being, who will never be confined in any frame. To explain just why these stories impress one so appears as difficult as to define why an ordinary face, encountered by chance in the street, might suddenly reveal miraculous beauty, through a smile perhaps, or through an unexpected expression of sadness. Many of the stories are dark, weird and often unspeakably sad in mood, yet there is no trace of personal frustration in them, neither harshness nor sentimental resignation; but an alert, constant awareness of life as a whole, and that profound, intuitive understanding of life which enables the artist to accept it. Welty’s writing, fiction and memoir, brings us the kind of stories we urgently tell loved ones, or simply turn over in our minds for a lifetime. They brim with human life and tug at us with that selfsame mystery. Hi, Richard. “A Worn Path” always reminds me of the saying that the journey of life is everything, the end not as much as we think. Though the old woman’s destination and goal are key, the journey is the journey of her life, in toto, so that the end only becomes significant because of everything else that happened to her on that day, which Welty disguises as only necessary to the end. She performs a sleight-of-hand twice, first by getting us to focus on the moment by moment account and take an interest in its challenge as if the end is less important, then, on the actual importance of the end, the literal importance, which disguises the symbolic importance of the journey (but not for long!). I’ve often wished that I could be so symbolically competent when I write, but to no avail. What a great analysis! Leaves me in the dust. Though in a way, I got what you say in the sense that it was her journey that amazed me this time. When I was a kid it was the “trick” at the end, her motive revealed.